Sahana Pradhan (17 June 1927 – 22 September 2014) was a Nepalese politician. She was Minister of Foreign Affairs until she resigned on 16 April 2008. In 1986, she became the leader of the Communist Party of Nepal. In 1987, the political party merged with another one. Pradhan was born in Kathmandu. 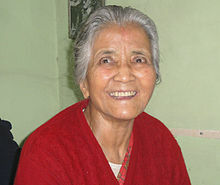 She was married to politician Pushpa Lal Shrestha until his death in 1978. Pradhan died from a brain haemorrhage on 22 September 2014 in Kathmandu. She was 88. ↑ "UML leader Sahana Pradhan passes away". e Kantipur. 23 September 2014. Retrieved 23 September 2014. This page was last changed on 27 December 2015, at 08:10.